With 46,377 residents, the City of Hattiesburg is home to roughly 25 percent of property that is located within a special flood hazard area (SFHA). The vast majority of homes and businesses within this area are older, low-lying and built prior to the FEMA flood designations; however, many of these properties have been elevated due to reconstruction that came after devastating tornadoes in 2013 and 2016. Additionally, several areas outside of the SFHA also pose a concern, as they are subject to flash flooding during itnense rainfall. Because of these factors, it’s important that homeowners and renters know the potential damage flooding can bring and how they can prepare for such. The resources found on this page and in our Online Storm Center will provide residents with everything needed to prepare for and respond to a natural disaster like flooding. The flood hazard in Hattiesburg comes primarily from The Leaf River and its tributary Creeks including: Gordon, Mixon, Burkett and Priest, which are within the Pascagoula River Basin. Some areas experience local flooding not directly associated with a river or creek. Floods in Hattiesburg are of relatively short duration. After intense rainfall, floodwaters can rise at a rate of two to three feet per hour reaching a maximum stage in two hours (or less). Floodwaters in some areas of the city can attain substantial velocities. April 6, 1983 was the last flood involving major river flooding with a river stage of 29.19 ft, and over 32 million dollars in damage. The latest flash floods were in the Mixon Creek basin area in January and March 1999 with rainfall characteristics that may have been in the range of the 500-year and 100-year frequencies, respectively. If needed, a representative from the City can make site visits to your home or property to review flooding, drainage and sewer problems. Additionally, a Certified Building Official is currently on staff to provide advice on the retrofitting of flood-prone structures (such as elevation of the structure and flood proofing). You can contact the Action Center at 601-545-4599 to request a visit. The Emergency Management District receives readings twice a day from the Jackson Weather Service for river flooding. The District also maintains their own gauges on the Leaf River and Gordon’s Creek, which are read daily. The Emergency Management District also monitors the National Weather Service data network, via a computerized satellite receiver system, on a 24 hour / 7 day basis. In the event of an actual flood, the Emergency Management District will immediately notify all local television and radio stations, local schools, government offices, etc. The City of Hattiesburg has enacted and enforces ordinances designed to minimize the severity of future flood damages. By doing so, relatively low-cost flood insurance is made available from the Federal government through licensed property insurance agents. This insurance may be obtained to cover future flood-related losses to most structures and their contents. THIS IS IMPORTANT BECAUSE FLOOD DAMAGE IS NOT COVERED BY NORMAL HOMEOWNERS’ INSURANCE. 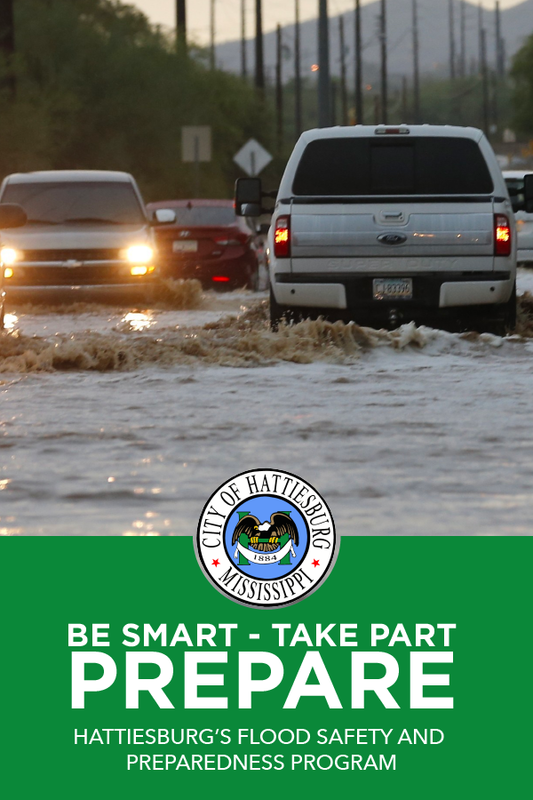 The City of Hattiesburg is a member of the National Flood Insurance Program’s Community Rating System, a voluntary incentive program that recognizes and encourages community floodplain management activities that exceed the minimum NFIP requirements. As a result, flood insurance premium rates are discounted to reflect the reduced flood risk resulting from the community actions meeting the three goals of the CRS: 1) Reduce flood losses; 2) Facilitate accurate insurance rating, and 3) Promote the awareness of flood insurance. 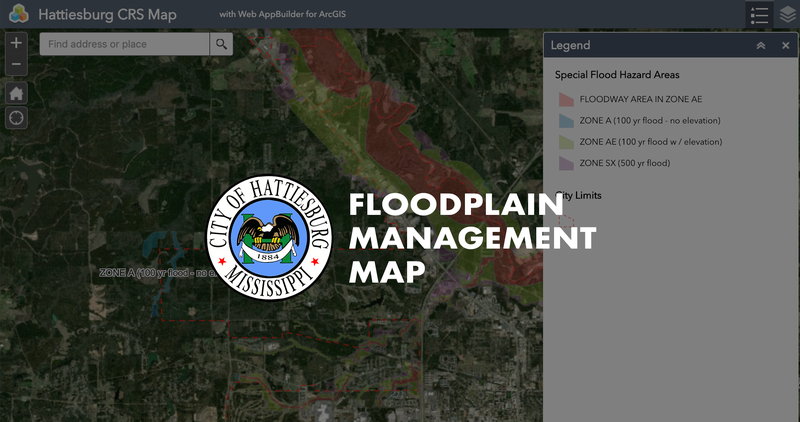 To check your individual flood hazard, floodplain maps and reference materials are available in the Land Code Department, on the first floor of City Hall, and are also available at the Hattiesburg Public Library and U.S.M. Cook Memorial Library. 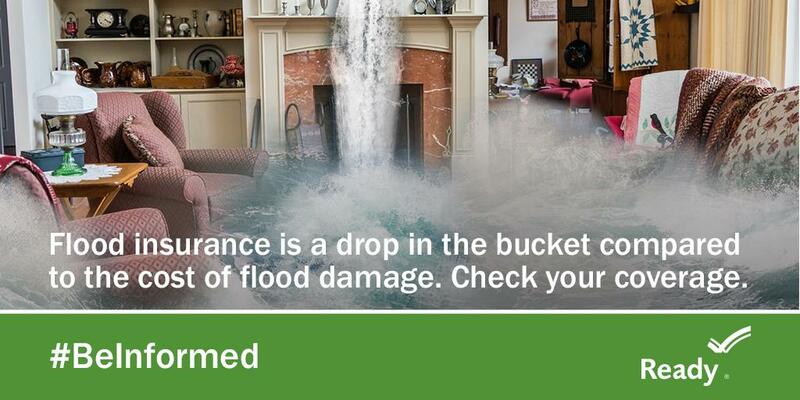 please visit the National Flood Insurance Program’s website. The City of Hattiesburg has flood damage prevention regulations that may affect how you remodel, renovate, or add on to your building. If your home is below the 100-year flood elevation, then the “cumulative substantial improvement” rule applies. “Cumulative substantial improvement” means any reconstruction, rehabilitation, addition, or other improvements to a structure totaling 50% of the fair market value of the structure during a 5-year period. Should the amount of work reach or exceed 50%, then the entire structure must be brought into compliance with Hattiesburg’s flood damage prevention regulations. Substantially damaged structures, due to fire or any other reason, must be brought up to the same standards if the cost of repairs equals or exceeds 50% of the structure’s value before it was damaged and must be elevated above the base flood elevation. For more information regarding retrofitting existing structures, please visit the following FEMA resources, http://www.fema.gov/library/. You should always check with the City Building Official before carrying out any of these types of work, or if you suspect work is being done that has not been permitted by the City. See below for a map of the City’s floodways and zones. Also available for historical information is a list of FEMA (1970 – 2010) Flood Hazard Maps and Flood Insurance Studies.